The last two years I have been involved in the marketing of a new startup: The HappinessBureau. Its mission is to make Happiness at Work the norm. In this article, I would like to show the 7 main aspects of our approach we’ve used and are still using in our marketing strategy. And apart from the successes, I will also show what didn’t work. 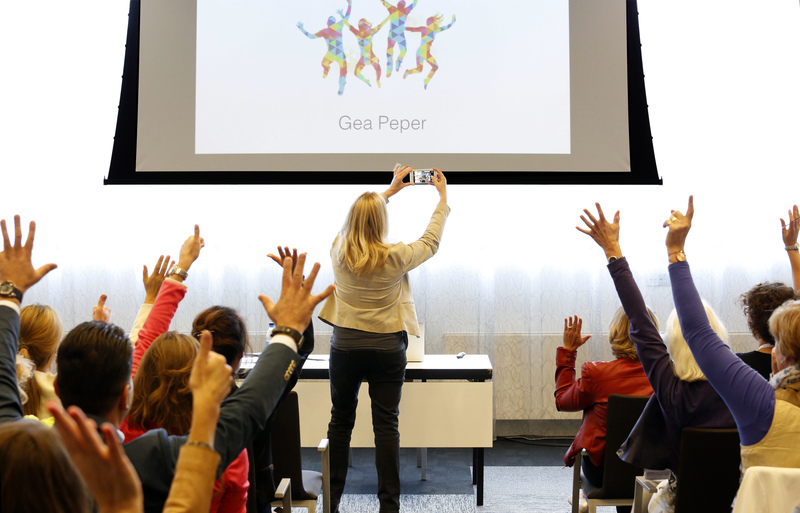 When Gea Peper started the HappinessBureau two years ago, she knew that Happiness at Work could be seen as a tree huggers theme; lots of people could see it as not relevant; as something that you might pay attention to at a team event, just for the fun of it. Happiness at work has been studied for years and the concept behind it, is actually quite simple. Happy employees are more productive, more creative, more motivated and less often sick than employees who are less happy. Organizations with happy employees have better (financial) results. Who doesn’t want that? So, from the start, we decided to call it what it is: Happiness at Work. Competitors branded it ‘ownership’, ‘leadership’ or ‘motivational improvement’. There even was an organization which named it ‘service delivery’, to make it more acceptable for their clients. It was and is okay if people or organizations are not ready to see what happiness at work could mean for their organization. But we would name it what it is. That decision also helped us to focus on our products and services. We would only offer products or services that would positively impact happiness at work. The workshop HR & Happiness at work made sense, just as becoming a reselling partner for the Happiness at work-game. Developing a leadership course didn’t fit in our focus, but a workshop on “Leading with Happiness” did. The focus gave the HappinessBureau a clear brand position: it’s all about Happiness at work. It helped us, as well as our clients. We’ve made one slight elaboration on the focus. We found that there were two perspectives to happiness at work: the employee perspective, which we call Happiness at Work and the organizational perspective which we call Employee Experience. 2. Think big, act small and do it! Gea Peper was at a Happiness at Work conference in Spain when she gave me a call. ‘I want to organize an event about Happiness at Work in the Netherlands too,’ she told me. And so, we did. And that’s how the HappinessBureau started. We could have started with a great workshop, a nice website and hope for the customers to come. Instead, we started with a national event in The Netherlands. The first event (fortunately) was so successful that we got spontaneous offers from organizations to host the second and third event at their location for free. Leo Bormans, author of the book The World Book of Happiness, during our second event. When we started, it became important to have two websites: one for the event and one for the HappinessBureau itself. After a few months, we wanted to be able to share more information about Happiness at Work, as part of our mission. We created a news site in Dutch. And at some point, we saw possibilities to go international. We took a step with something we could handle, because we had done it before: a news site about Happiness at Work. But now of course with English articles. And with that site, new possibilities came. We sent request to international experts to interview them for the website. Whenever we were abroad for business, we could make a video and post it on the site for our international readers. We were able to reach out to international advertisers. We also started a tour with Alexander Kjerulf, a worldwide expert on the subject Happiness at Work. First, people and organizations want to know more about Happiness at Work. Second, they want to see how others do it. Third, they want to know how they can do it themselves. The game offers support for businesses who want to introduce it within their organizations and we found out that it fits in the third phase. We introduce it in some of our workshops, so the participants can experience themselves how it works. Remember when you had to sell cookies or raise money for charity? Who did you go to? Family, friends and neighbors of course. So when the HappinessBureau organized its first event, or wanted to try out a workshop, we turned to the people from our network that we knew well. It is sometimes just that simple. A neighbor heard about the HappinessBureau, just by talking to her at a street BBQ. She was really interested and invited Gea to give a presentation at The Lions Club she was a member of. And after that, more workshops followed, which gave Gea the opportunity to try-out and perfect her presentation on Happiness at Work. We used and use the same principle for other services and products. For our first national event (Happy People – Better Business) we asked a cousin (with experience in the field) to hold a speech, a former colleague to help organizing the event and send invitations to our network on social media. In two years, we have built a network of more than 10.000 people which we can reach out to if we have a new product, service or event. They now know who we are, what we do and what our quality standards are. This approach works very well for us, because we’ve made the decision that we would like to grow step-by-step. We chose not to hire employees but instead use our network of partners if in the case we couldn’t handle it all ourselves. With a relative new category as Happiness at Work is, we realized that it is essential to inform people about the subject and about the HappinessBureau. For us, this grew organically: we’ve developed a platform to spread information about Happiness at Work, about the HappinessBureau and searched for ways to interest people to take a look at the sites. Happiness at Work is a business oriented subject, so we started with LinkedIn as our primary medium. We have a Facebook page, a YouTube Channel and Twitter accounts, but LinkedIn is by far (yes, by far) the most successful channel to reach our potential clients. We started with links to interesting articles, followed by our articles we’d written ourselves and were published in different magazines. The Dutch news site exists a little over two years now and contains more than 440 articles on Happiness at Work and related topics. The amount of views is growing fast and around 30.000 views a month at the moment. We promote new articles via LinkedIn and other social media and with the growth of the number of articles, we saw that search engines became more prominent in directing interested readers to our site. They are now responsible for about 20% of the visitors. Our LinkedIn like-view ratio is around 100 on average, which means that 1 like on a LinkedIn post equals 100 views on that same LinkedIn article. I have no comparable reference if that’s normal, good or bad. Digital is great, paper still counts. The HappinessBureau writes articles for popular Management and HR magazines. The great thing about that is that we can reach out to the people who are reading the magazine, our target group. Nice side effect is that we can publish the articles online on our news sites and LinkedIn as well. What are the most popular articles on our sites? The long reads. Where every online editor will advise you to write your text short and concise, readers of Happiness at Work articles prefer more substance. What works for us on LinkedIn? The usual LinkedIn tips: use a photo, write a good headline and next to that: personal news like the signing of a book contract or doing the tour at Zappos. For the 1st Happy People Better Business event we’ve sent letters to the Dutch municipalities, inviting the HR-department to come to the event. It didn’t work, no one came. For the 2nd event, we advertised on a billboard next to a busy highway. We were very proud and used a picture in promoting the event. In the evaluation of the event, only two people stated the billboard was the reason for coming. Although it didn’t cover for the costs, it added to the brand perception of being professional. We have two free eBooks (in Dutch and English) and more than 1000 people have downloaded them. This again taught us that Happiness at Work is something interesting for all organizations: small, medium, big and for finance as well as government, hospitality, pharmaceutical, insurance, retail, aviation, telecom and all the others. Marketing wise, I have not felt the need for segmentation. The printed version of the eBooks are a great give away after a meeting. Again, for people new to the subject of Happiness at Work, the eBooks supply them with more information.